Poetry expresses the self, captures the world, and gives both poet and reader new ways of seeing. Whether you’re a keen novice or working on your fifteenth collection, and whatever your background, award-winning poets Fiona Sampson and David Harsent will help you take your work to a new level, show how the craft of poetry leads to the art of poetry, help you fashion and edit your poetry with an eye to publishing, and give you new skills and ways of going on to make your future work sing. Four days of workshops, one-to-one tutorials and readings in a friendly, inspiring work atmosphere and the beautiful setting of Hellens Manor. Timed to occur just before the Festival starts so you can immerse yourself fully in the 10 days of Ledbury Poetry Festival that follow. Professor Fiona Sampson is a leading British poet and writer. She is published in thirty-seven languages, and has received many national awards as well as international prizes in the US, India, Macedonia and Bosnia. A Fellow of the Royal Society of Literature, she has an MBE for services to literature. Her critically acclaimed biography, In Search of Mary Shelley (2018), was published in 2018. 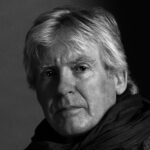 David Harsent is a British poet and librettist. He has published twelve volumes of poetry. Legion won the Forward Prize for best collection 2005; Night (2011) was triple short-listed in the UK and won the Griffin International Poetry Prize. Fire Songs won the 2014 T.S. Eliot Prize. His most recent collection, Salt, was described by John Burnside, writing in the New Statesman, as ‘a masterpiece’. Harsent is Professor of Creative Writing at the University of Roehampton and Chair of the Roehampton Poetry Centre. Hellens Manor is an ancient family home dating back to the C11th. The course will take place in the recently refurbished Georgian Stables which sit in the landscape of lawns, meadow and paddocks. The rare C17th octagonal dovecote, a physic garden, yew labyrinth, herb and kitchen gardens, woodlands and ponds are a delight to the eye and nourishment for one’s spirit. The closest railway station is Ledbury where there is a list of local taxis for the 5 mile journey to Hellens. Volunteer Festival transport may be available for train collections and drop off if arranged in advance. Large double room with en-suite. (2 available cost £425). These two are on the ground floor. These prices include the course, accommodation and delicious home made food cooked on the premises from midday Monday 1st July to 2pm Thursday 4th July. These are early-bird rates, valid until 24th May. After that date all rooms will be £425. Once you have booked a place we will contact you for information about dietary requirements etc.